Wall murals have proven popular for many years. They are a top choice when it comes to creating accent walls in various rooms of the home and businesses too. While we might think about adding superior style and class by installing a mural, it’s also a great way of adding color and creating the right mood or atmosphere. This means that the use of murals is limitless and you can definitely enjoy some amazing benefits when using the right design in your child’s room. Before discussing the benefits, it’s important to understand why you need to choose the right design. Different murals suit different environments and you need to think about your child and their needs when selecting a mural for their room. Some murals are perfect for babies and young children while others are designed for older children and teens. Murals with a fair amount of detail and bright colors can help encourage creativity and create a positive environment. The color green is associated with a sense of calm and can encourage learning. So, keep these points in mind when selecting a design. Although many people focus on practical skills like learning mathematics or language skills, art is sometimes neglected. Art can, in fact, benefit children in many ways including visual learning, motor skills, inventiveness, and cultural awareness. It can even have a positive impact on learning languages, decision making, and it can help improve a child’s overall academic performance. You can stimulate your child’s artistic nature by adding a mural to their wall. This mural will help inspire them and their creative side. The more a child explores their creativity, the more they will learn. Remember, the things a child learns early in their life will create the foundation for future learning. Which is all the more reason to invest early. The mural you choose will help create a very personal element in the room. If your child is older, it might be a good idea to ask your child for their input too. Start by searching for and select a few options. The let your child take their pick from the options you have selected. This way, they will feel like they have contributed to the design process and this will make their room an even more personal space. This adds to their sense of security and privacy. We all need our own personal space and children are no different. It’s good to know that you can achieve this simply by choosing the right mural! It’s important to remember that not all murals are made equal. Some are of inferior quality and, if you want to enjoy maximum benefits, it’s important to make sure that you select a quality mural. Before making your purchase, make sure that you ask about the care instructions. Are you able to wipe the mural down with clean water and a sponge? Can the mural be removed and reused elsewhere? If your child is older, they may have enjoyed some artistic ‘freedom’ in the form of drawing on walls or testing the effect of food on paint. There are many stains that can’t be cleaned and they even show once painted over. Oil is particularly difficult to get rid of once it hits a wall. Fortunately, you can cover up these and other flaws by adding a mural! So, there is no need to scrape away any paint or apply several layers just to hide a problematic area. Just make sure that the wall is clean and smooth before applying your mural. If there are pieces or chunks of dirt stuck to the wall, it will prevent the mural from adhering correctly to the surface and it could appear lumpy or bumpy. Never underestimate the power of a child’s joy! 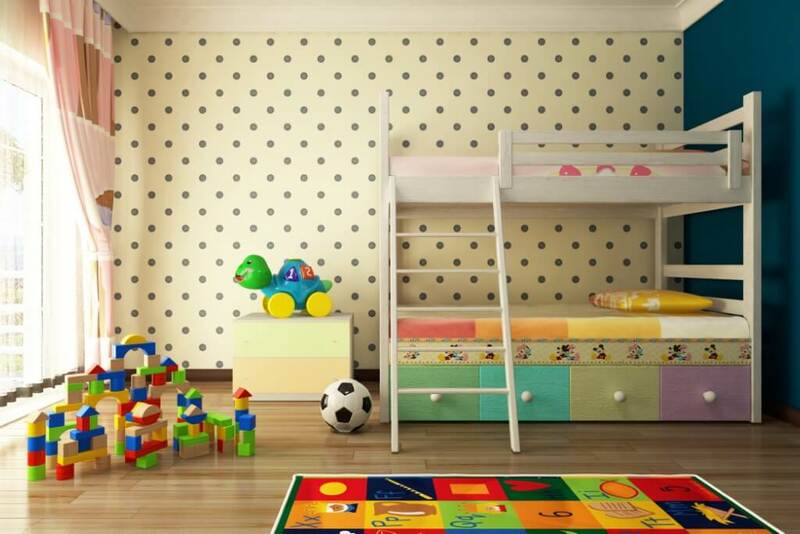 When you see the look on your child’s face when they enter their newly decorated room, it will all be worth it. Don’t be surprised if you can’t get them to leave their room for several hours. Another great tip to consider is planning a theme or design that includes a wall mural as well as a ceiling design that will help reinforce this theme. For example, you could decorate the ceiling with stars in the night sky and you could add a fairy forest or magical mural to one of the walls. At AV Style, we have a wide variety of stylish mural designs as well as quality stretch ceilings and everything you need to create the perfect environment for your child. Whether you already have a design in mind or you would like some expert advice, contact us at 1 (866) 787-5103. We are always happy to offer professional expertise.